The end of the “apparitions” announced by the Lady of Medjugorje has raised one of the most, if not the most important objection that has hindered the recognition of their supernatural character. According to the visionaries’ tape recorded declarations, the Gospa – the Croatian word meaning the Madonna or the Virgin Mary – announced, on June 30, 1981, that she would appear to them three more times. On July 3, ten days after the beginning of the happenings, the visionaries confirmed, before five adults, three of whom were priests, that their meetings with the Gospa were once and for all over. Twenty-nine years later, in 2010, the daily encounters of some of the visionaries with the Gospa continue to attract millions of pilgrims. What has happened? In this editorial post on the historical grand concealment, we will try to establish the facts that constitute the solid basis of that troubling cover-up. Then, in the next editorial post on the actual duplicity, we will identify the manoeuvers deployed by informers and key protagonists to conceal those informations that were interpreted as a threat to “the good cause”. They consist in the first section of Vicka’s Diary, one of the visionaries, and of 15 transcripts of taped interviews conducted by the Medjugorje pastoral personnel with the six visionaries, between the 27th and the 30th of June, 1981. I have presented elsewhere my encounter with Franciscan Father Ivo Sivric and the modalities of our collaboration that led to the publication of La face cachée de Medjugorje, in 1988, and its English translation, The Hidden Side of Medjugorje, in 1989. Are our primary sources authentic? The authenticity of the magnetic tapes that contain the conversations that have been transcribed is no more open to doubt. The original tapes are stored in the St. James parish archives and the duplicates are left at the bishopric of Mostar and at the residence of Mr. Grgo Kozina, a parishioner who has generously reproduced them for his friend, Fr. 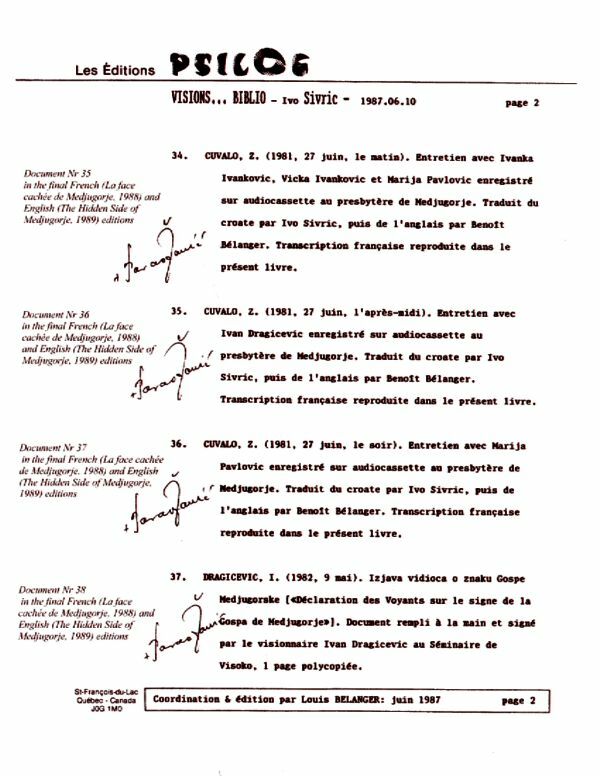 Sivric, and for Mrs. Daria Klanac, a Canadian citizen of Croatian origin and Medjugorje devotee, who published her transcriptions in French, in 1998. 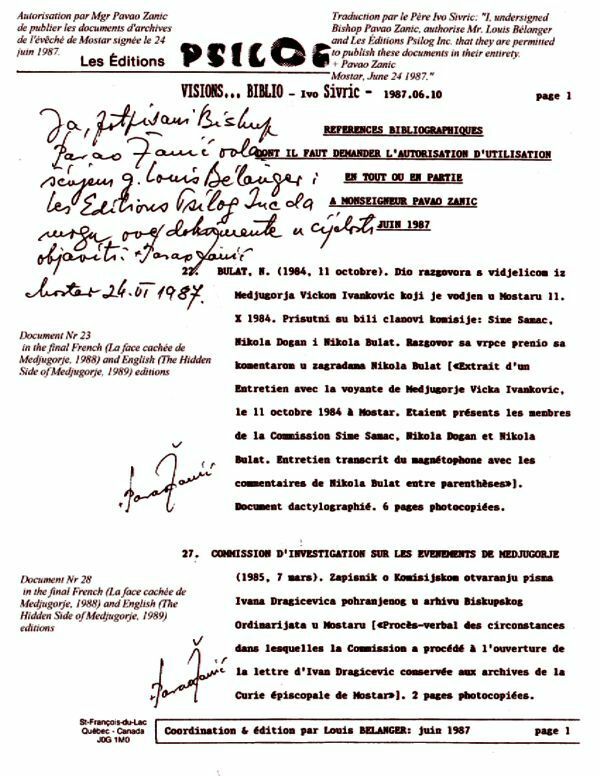 In 1987,I asked the Ordinary of Mostar to confirm in writing his permission to publish by validating each of the 38 documents and their translation into the French language that he knew well. 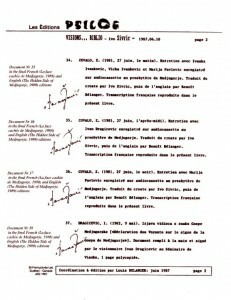 He accepted with good grace as indicated by these first two pages of a complete list that he marked with his signature. 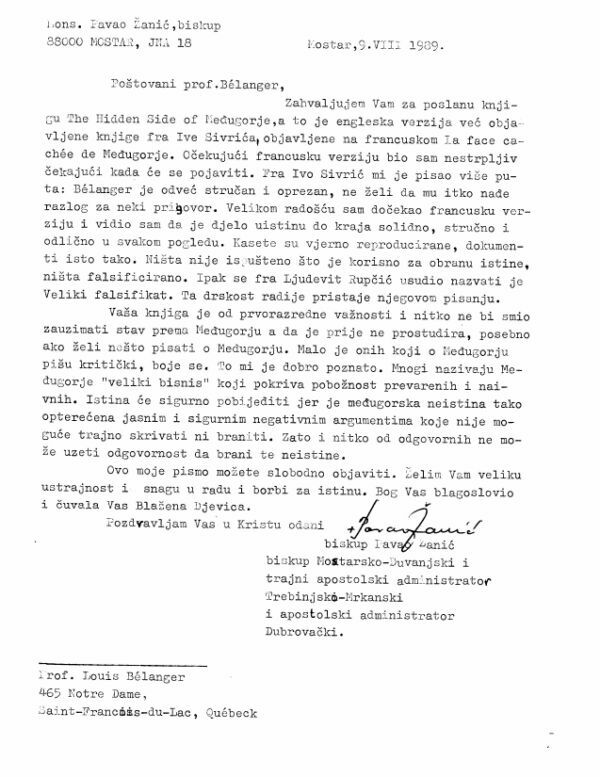 Ivan Zeljko, a theologian and psychologist whose mother tongue is Croatian also paid an hommage to Fr. 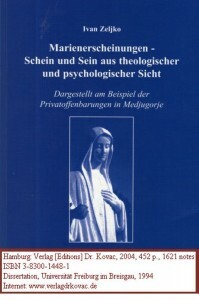 Sivric in his doctoral thesis in theology (452 pages, 1621 notes) published in 2004: Marienerscheinungen – Schein und Sein aus theologischer und psychologischer Sicht – Dargestellt am Beispiel der Privatoffenbarungen in Medjugorje. Let us speak instead, about the merits of Father Sivric. He published and translated numerous interviews of the seers recorded from the first days, and gathered on tape by Monsignor Zanic and his commission. Father ZOVKO: What do you think, is she going to come tonight? MIRJANA: I think that she will, it’s for sure, she told us. Father ZOVKO: Perhaps she won’t. Father ZOVKO: What do you think, how many [more] days will you be seeing her? Before reproducing some parts of the interview with the visionaries, it is important to situate the context of the event. The “apparition” does not take place on the Podbrdo, but rather in the village of Cerno, which is six or seven kilometers from Medjugorje; specifically, it happens along the road connecting Mostar to Citluk and Ljubuski. Two young women are with five of the visionaries, since the beginning of the afternoon. Ivan is absent. My second cousin, Mica Ivankovic, is employed by the county as a social worker in Citluk. Now married, she is not a Party member and goes to Mass and Communion every Sunday. Ljubica Vasilj-Gluvic lives in Sarajevo. An employee of the Bosnia-Herzegovina Republic, she works on the Executive Council and is a member of the Communist Party. Ljubica is a very charming girl, well spoken of even by the visionaries, who had nothing but praise for these two young women. I am pointing out these facts because later, all sorts of disparaging stories were circulated in many places about these two fine people. Other innocent people have also been maligned. The underlying idea in all of these calumnies was and still is to make people believe that God has a grudge against those who do not approve of or do not give their support in any way whatsoever to the Gospa’s apparitions in Medjugorje, or who are against them. As for their stopping in Cerno, it was really just happenstance. 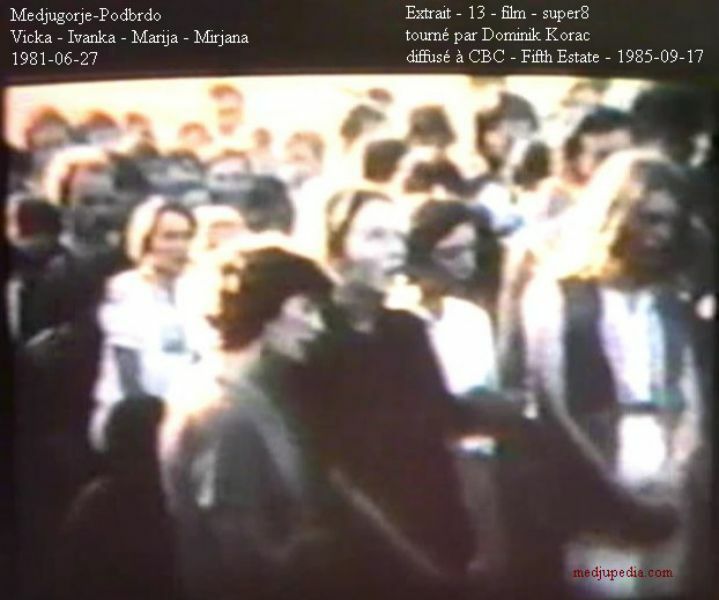 They arrived there at 6 p.m. Mica said that the communist authorities in Citluk were not considering removing the visionaries from Medjugorje that day, nor that they, Mica and Ljubica, had been sent by any official to carry out that task. 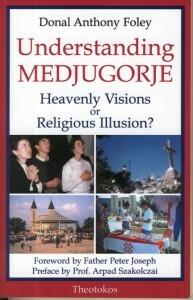 The idea of leaving Medjugorje came originally from the visionaries themselves in order to verify that the Gospa could appear to them elsewhere. Thus, Mica and Ljubica took all the visionaries except Ivan for a ride in the car. First they went to an amusement park in Pocitelj, then stopped in Capljina, and then at the Kravica falls before returning to Medjugorje. When the time came for the visions, Ljubica stopped the car and they all got out. The visionaries withdrew in order to have their vision, but the two young women kept close to them to see what they would ask. This time, Mirjana talked to the Gospa and asked some questions. On the way back, the visionaries stopped at the parish house in Medjugorje where they were questioned by Father Zovko. Father ZOVKO: Please tell me in detail, what did you talk about with the Gospa? MIRJANA: Three more days, which means until Friday. Then, we asked her if she was angry because we left the hillside [Podbrdo] and because we came here to the other place. She said that she was not angry. Father ZOVKO: Where is it? MIRJANA: We left a marker over there where we’ve been. Father ZOVKO: Was it near the road? MIRJANA: Yes. Then we asked her if she would be angry if we don’t go to the hillside [Podbrdo] anymore but rather into the church. She was rather indecisive when we asked her this question. It looked as if she didn’t like it. But finally, she said she wouldn’t be angry. One of the visionaries: She would appear at the same time. Father ZOVKO: Wait! Is that going to be in the church at 6:30 p.m.? Father ZOVKO (very much surprised): What? MIRJANA: That we may come to church at 6:30. MIRJANA: Until Friday, which means Wednesday, Thursday, Friday. Father ZOVKO: Therefore, you will be in the church tomorrow? And she asked more. How many [more] times she was going to appear to them. They said in unison: “Three times.” Then Mirjana-I don’t remember now whether it was Mirjana or somebody else-asked [her] to leave a sign.
? (most probably Father KOSIR): Who said that? ONE of the visionaries: The Gospa.
? (most probably Father KOSIR): Which of you said that?
? :… (incomprehensible). Ivo Sivric’s remark: Everyone is talking at once. Father ZOVKO: Well, this interests me. “Three more times!” Well, when is all this going to end? ALL the visionaries (in unison): On Friday. Father ZOVKO: Where is it going to end on Friday? What have we shown in that first part of The Grand Concealment? Our sources are authentic, the transcripts are reliable and even appreciated by one of the most famous propagandists of Medjugorje. In a very explicit manner, without the least ambiguity, the visionaries transmit with precision, by mutual agreement, the announcement of the end of the “apparitions” by the Lady of Medjugorje. One would expect that such a capital announcement would have been communicated with all of its veridical content by the Medjugorje eminent protagonists who knew about it since the beginning of the events. 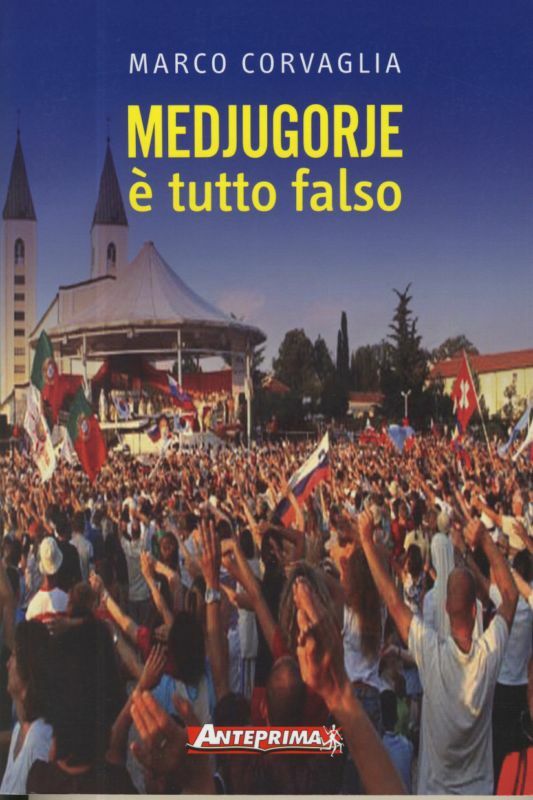 The cover-up remained until the publication of The Hidden Side of Medjugorje, and even after, since the majority of the fervent pilgrims and of the devotees who are intolerant to critique are ignoring that announcement. In our next editorial post on the actual duplicity, we will identify the manoeuvers deployed by informers and key protagonists to conceal those informations that were interpreted as a threat to “the good cause”. Your commentaries are welcome, except the “anonymous” ones that will be discarded. Your subscription to News from the past… – right column – will trigger an automatic recall at their publication… that will come out more frequently than the editorial posts. Kevin, you asked if I can prove anything regarding Rome’s desire to “protect Medjugorje.” Yes, of course. What Rome is protecting is, obviously, the continued good fruit—that is, conversions, vocations, etc. They’re not protecting the seers or theology! Because again, I point out that “salvation” is precisely the entire goal of the Church’s existence, as Pope Paul VI stated: “The Church exists to evangelize.” And so, when we speak of good fruits, we are speaking of the most profound and important of all, and that is conversion of the heart. The Church does not need Medjugorje for theology; we have the deposit of faith. And from what I’ve read over the years from Medjugorje, the Blessed Mother is not giving a deeper theological understanding of any revealed truth, but is merely calling her children to “prepare” by prayer, frequent confession, fasting, and meditation on the Word of God. Incidentally, all four of those points have subsequently been reinforced by the Holy Father through the Catechism, synods, and so forth. Now, to answer your question: what has the Church said to “protect” Medjugorje? And by protect, we mean to allow the possibility of authenticity to remain open. Otherwise, the local ordinary’s decision would have been upheld, and that would be that. Regarding the local ordinary, it is common for the “anti” Medjugorje folk to always cite the local ordinary’s decision. This is fine—except the Vatican has taken the unprecedented step of over-riding his decision. I have to say I find it remarkable that you and others have not yet understood this. 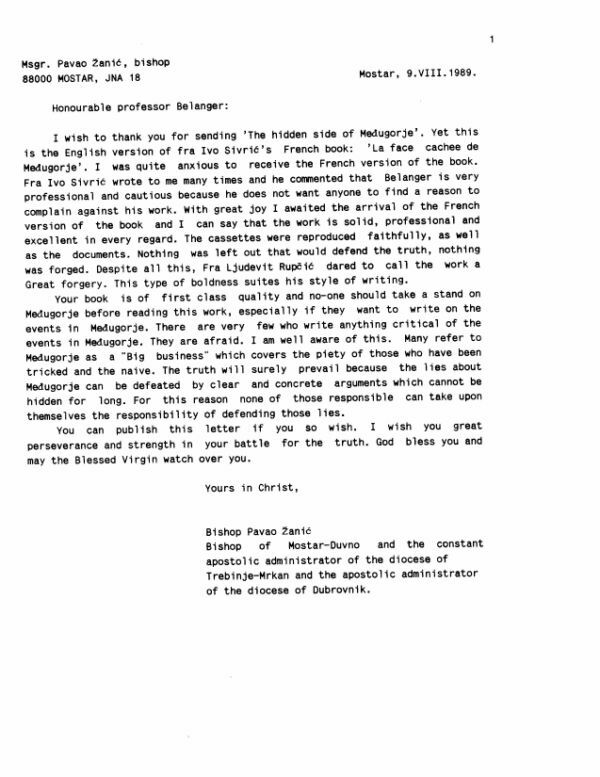 In a letter from the Congregation for the Doctrine of the Faith from then Secretary Archbishop Tarcisio Bertone (May 26th, 1998), he described Bishop Zanic’s negative decision as “the expression of the personal conviction of the Bishop of Mostar which he has the right to express as Ordinary of the place, but which is and remains his personal opinion.” This repeated the official stance of the Holy Father, as put forth by his spokesman: “We repeat the absolute need to continue deepening the reflection, as well as prayer, in the face of whatever alleged supernatural phenomenon, until there is a definitive pronouncement.” (Joaquin Navarro-Valls, head of Vatican press office,Catholic World News, June 19th, 1996). 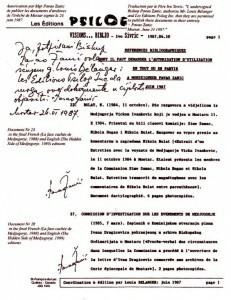 Archbishop Bertone added, “as regards pilgrimages to Medjugorje, which are conducted privately, this Congregation points out that they are permitted on condition that they are not regarded as an authentication of events still taking place and which still call for the examination by the Church.” Clearly, the Vatican wished that the examination continue, and furthermore, that nothing inhibit the organic process already begun, including the visitation of pilgrims: “ You cannot say people cannot go there until it has been proven false. This has not been said, so anyone can go if they want. When Catholic faithful go anywhere, they are entitled to spiritual care, so the Church does not forbid priests to accompany lay-organized trips to Medjugorje in Bosnia-Herzegovina” (Catholic News Service, August 21, 1996). Archbishop Bertone further reinforced the Church’s position the following year when he said, “For the moment one should consider Medjugorje as a Sanctuary, a Marian Shrine, in the same way as Czestochwa” (as relayed by Sr. Emmanuel of the Beatitudes Community in her book). For the moment. This is all to say, Kevin, that the local ordinary has NO jurisdiction any longer over this matter in terms of regulating the phenomenon. He was asked in fact to help accommodate the spiritual needs of the pilgrims and to cease his negative rhetoric (which has been very divisive). And so brother, are those who support the phenomenon of Medjugorje—including the late Great John Paul II—Catholics who “refuse to see the facts,” who “don’t want to face the music”, etc. etc.? Or are they simply following the lead of Rome? It is time that the worn out defence of the Bishop of Mostar’s position be dropped once and for all. To continue to use this not only degrades the force of your arguments, but reveals that you do not fully comprehend all that has taken place on an official level. Besides, let us be honest here: we know that many Bishops have not only been wrong in their judgments, but some are in apostasy. So to ignore the official and authoritative decisions of the Vatican, somehow suggesting that they do not carry more moral force than the local ordinary when it has been explicitly stated as such, suggests you do not understand the order of hierarchy. Kevin, it is essential for the sake of unity—so that Medjugorje does not become “divisive” precisely as you say—that the faithful fully respect the Magisterium in this regard. This does not mean that Mr. Belanger cannot produce the evidence as he sees it. By all means. We are all interested in the truth, or should be. But in the face of the overwhelming positive and authoritative decisions of the Vatican, it seems to me to be lacking in humility to come out with such titles as “The Grand Concealment”, accusing the seers of being liars. After all, the Vatican itself stated, “…until it has been proven false. This has not been said…” Is not the humble thing to say, “I respect the Vatican’s decision to override the Bishop of Mostar and all things to continue, but I am confused by this… and feel this should be examined…”? Instead, Mr. Belanger has indeed overstepped his boundaries by declaring in his title that the children of Medjugorje are “lying.” Whew. That’s pretty bold. Are they? Is there another possible answer? Were they “lying,” or did these children misunderstand? Was it a satanic apparition at that point? Or could it be the the very plausible understanding of “three more days” based on what John Paul II and Sr. Lucia of Fatima have said; that the Mother in this instance may have been symbolic (see above)? To publicly call a brother or sister in Christ a liar, when the Vatican continues to examine carefully the possibility that the seers are telling the truth, is to me what is divisive and slanderous and an affront to an important and delicate process which is still underway. I doubt Mr. Belanger has met the seers, and so, it is not I, but Mr. Belanger who has potentially impugned his integrity. I mean, what if the Vatican pronounces in favor of Medjugorje? This is why I say that one can still question the evidence, still produce the facts, in such a way that it adds to the process without caustically dividing the body. 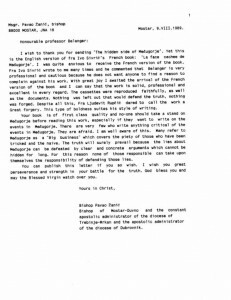 For the approach of Mr. Belanger implies that he holds the smoking gun; that he no longer requires the discernment of the Vatican, all the scientific and theological inquiries, the testimonies, and other mounds of evidence that require the attentive and rigorous analysis of “qualified” theologians and experts. No, Mr. Belanger has declared that the apparition is false, and that the children are liars. Lastly, the millionaire in question is a public figure; I have seen him subsequently in the media. He is responsible for also taking down some pro-Medjugorje ministries through damaging slander. I would reveal names, except that his behavior, which also tended toward violence, may have put this journalist in some danger, and this may still be the case. This was all relayed to me first hand by the journalist, who has a critical mind towards apparitions. Thank you for your response. It is not possible for me to respond line-by-line on this forum and so I will condense myself to a few points. Before you object, go back and reflect upon what you wrote. Now, can you honestly prove that in any of the documents? Where does the Vatican say this? Don’t bother to look, you won’t find it. The Vatican is not “protecting” anything but the proper preservation of faith and good morals. Now 20 years after the Zadar 1991 declaration, the Vatican takes command. I wonder why? Let’s think about this further. For nearly 20 years the Conference has issued next to nothing on the matter. However, miscellaneous statements have been floating around in that interim, with perceptions following quite closely upon the heels of those statements. The faithful are running to Medjugorje in droves–despite the opposition of the local Ordinary and a negative decision (for the non constat is a negative category) of the local Conference and taking sides “pro” and “con” Medjugorje. That’s some pretty serious division in the Church. Let me be clear: the facts support the interpretation that it was simply time for Rome to act and that its intervention is not an act of protecting Medjugorje. It’s an act of preservation. If you need a reference point for such, this was referenced in Normae S. Congregationis in speaking of the intervention of the local Ordinary and how he must be prudent in his actions towards an alleged private revelation, lest he be misconstrued. Regarding fruits, you continue to go back to this despite your own acceptance of my earlier point that they are only one criterion. No one is trying to neglect the fruits. Absolutely no one. All that is being attempted is to place them within their proper context both historically and theologically. The propaganda machine of Medjugorje is quick to point out the fruits, but this is simple ignorance of the taxis of discernment. Fruits are not looked at first. They simply are not. Diane Korzeniewski wrote a fairly recent blog article discussing this. I invite you to read it. You seem to impugn upon Belanger’s integrity when you speak about looking at all the evidence. Considering the fact that Belanger was looking at evidence most people didn’t even know about, I question impugning him…if such was your intention. I hardly think he is above the commission either, though I don’t pretend to speak for him. Vocations & Medjugorje: I forget exactly how the philosopher once put it, but Dean Schindler quoted it with respect to the recent controversy on Christopher West. “You don’t pay attention to a man’s subjects, but his predicates” (or vice versa). Millionaire & Media: I want names and I want facts, simply put. I apologize. The formatting of this Comments area is sorely lacking. Paragraphs do not seem to appear. The reader will have to guess where my response begins! Cheers! 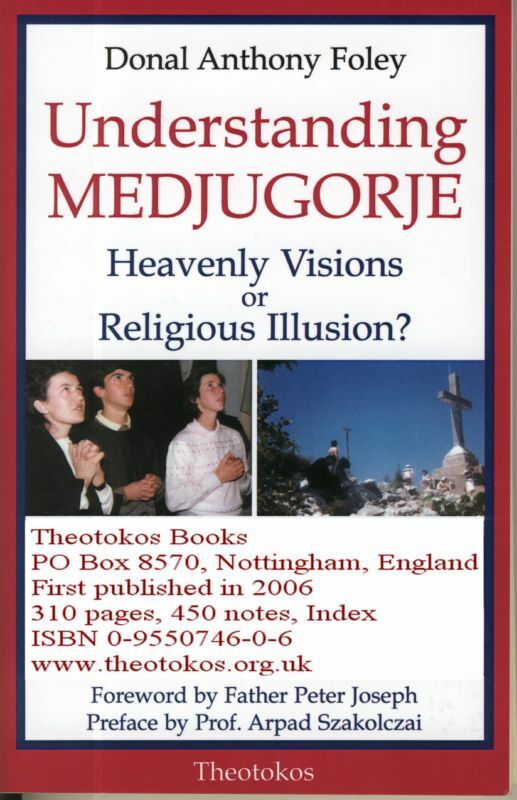 1) Post-March, 2010, I continue to see references in Medjugorje literature to the Vatican’s commission. Oftentimes, I see it within the context of serving as a “trump card” intended to signal the cessation of any further intellectual discussion of the facts of the case. This is usually to the detriment of those who question Medjugorje and is intended to throw egg on their face. It is a most unjust tactic and terribly despicable in its range. Maybe some feel that way. I certainly don’t. The fact remains that the Vatican has turned down any opportunity the Bishop of Mostar or previous commissions have given for the Vatican to say, “Okay, enough. Constat de non supernaturalitate!” A brief study of apparitions reveals that this is an unprecedented action, since the Vatican always defers to the local ordinary in these cases. But not here. Why? And so, the appeal I make is that there needs to be a great humility, on both sides of the issue, before the discernment of the Sacred Congregation and the Holy Father’s decisions in this regard. If there is a certain irritation detected, perhaps it is because some have already declared the apparitions false when even the Bishops conference of Yugoslavia declared that “the supernatural character is not established”. This has been the Vatican’s unstated declaration as well, by once again forming a new commission to investigate the “good” and “bad” fruits. 2) In the Church’s theology of private revelation, “fruits” hold a “pride of place,” as it were, because of its special mention in the Gospels by Jesus Himself. However, as Cardinal Ratzinger also points out in his book “God and the World” in speaking of false prophets, “It is always true that the fruits are only one criterion.” I encourage you to do a further study of “fruits” and their place within said theology. Personal qualities of the subject—mental balance, honesty, and rectitude of moral life, habitual sincerity and docility towards ecclesiastical authority, ability to return to the normal manner of a life of faith, etc. With regard to the revelations, their conformity with theological doctrines and their spiritual veracity, their exemption from all error. The “fruit” are only one aspect. But with regard to Medjugorje, the “fruit” are not negligible. As I mentioned earlier, I know of several priests with worldwide ministries, names you might immediately recognize from their ministries on EWTN and elsewhere, who have confided to me personally that they were brought into the priesthood by “Mother” at Medjugorje. Cardinal Schonborn said his seminary would be empty it were not for that place. It is understandable, then, that given the priestly vocations (this fruit alone) that have come from Medjugorje, that the Church is hesitant to allow even the local bishop’s unequivocally negative decision deter the ongoing conversions from that place. This is to say that if Mr. Belanger is looking for absolute perfection in the visionary’s understanding of what Our Lady has been allegedly conveying, he likely won’t find it. Furthermore, in this matter, we are not speaking of a theological error, but an error of perception or something else, perhaps even diabolical interference (unless the children are in fact liars). Did the Blessed Mother literally mean “three days”? Certainly, that’s how the visionary perceived it. Or was our Mother speaking symbolically? The Holy Father, John Paul II, said to Bishop Paola Hnilica, “Medjugorje is the fulfillment and continuation of Fatima.” If that is the case, then listen to what Sr. Lucia said, “Fatima is still in its Third Day… the Fatima Week has not yet ended… The Triumph is an ongoing process” (God’s Final Effort, John Haffert, p. 2). That is to say that, if the “period of peace” she promised at Fatima is the “seventh day”, a day of rest or “era of peace”, then there are “three more days” left until that day, and of course, her apparitions would no longer be necessary. Could it be that the “seers” misunderstood a symbolic phrase of Our Lady? That they heard her correct, but understood her wrongly? Last, let me point out that, even if the visionaries were wrong on this point, it does not “wipe out” the entire body of alleged messages. As Dr. Mark Miravalle points out in his excellent summary on the Church’s position on private revelation, “Such occasional occurrences of flawed prophetic habit should not lead to the condemnation of the entire body of the supernatural knowledge communicated by the prophet, if it is properly discerned to constitute authentic prophecy” (On Private Revelation, p. 21). In cases where beatification or canonization are at stake, Benedict XIV pointed out that “as long as the individual humbly acknowledges his error when it brought to his attention,” the case should not be dismissed (Ibid.). 3) I think you are being dishonest with yourself. Throughout, you state your intention not to dispute Belanger. However, the practical effect of your words does just that. In reading your text, it comes across to me that what you intend to say was you do not wish to come across as hostile in making your points. It is a key difference and perhaps a minor point but it is easy to mistake one thing for another, sort of like alleged private revelations. I think you’ve misunderstood my point, which is to say that his “facts” are irrelevant in the greater picture. That, even if this were a diabolical lie, the good forthcoming has been astounding (despite the “bad fruit” that no doubt would also accompany any apparition site. Just look at the “approved ones” and the controversy, politics, and commercialism that have abounded). It is not a matter of dishonesty, but calling for reason to prevail. And reason states that Mr. Belanger is not above the Vatican’s Congregation, or the pope, who has insisted time and again on examining ALL the evidence. To declare the apparitions false, then, is not only irresponsible, bit irrational given the authoritative decisions in this matter. I’m sorry. I’m not willing to declare them true or false. It’s not my jurisdiction. I am simply praising God for the immeasurable fruit I have personally witnessed. I am a former journalist, if that matters, and so integrity in this matter is essential to me. Thus, my journalistic instincts (and reason) suggest that there is more to this than meets the eye. Otherwise, the Vatican would not stop any and all efforts made to put Medjugorje in an officially bad light. At least to this point. 5) Regarding priests: The Church’s theology of private revelation does not admit that vocations to the priesthood and religious life are a definitive factor that makes supernatural an alleged private revelation. Thus, you are on very shaky ground, doctrinally and theologically, when you raise this point. 6) I cannot know the eternal destination of your relatives’ souls. Quite frankly, if, after reading the materials on Belanger’s web site you are concerned about the destination of your relatives’ souls, might I suggest praying for them? If the fruit of Medjugorje has not doubt led to millions of conversions, priestly vocations, and “relatives” likely being admitted through the pearly gates, then this diabolical “scam” of Medjugorje is failing Satan miserable. If I were the devil, I would cut my losses and kill the whole thing. Of course, I’m being facetious. Again, I don’t know if Mary is appearing to these six seers or not. But I can state, with near certainty, that Catholics worldwide are encountering the Mother there. That is question Mr. Belanger has to face… “For if this endeavor or this activity is of human origin, it will destroy itself. But if it comes from God, you will not be able to destroy them; you may even find yourselves fighting against God.“(Acts 5:38-39). Or one could say, if God is using this so powerfully, then do I really want to “take it down”? that is the “honest” point of my initial post. Your response indicates that you have not done as much research in Medjugorje as others have done. You state that you have not seen any “bad fruit.” Yet, Belanger and others provide much evidence that makes one scratch their heads. Before you continue in the discussions, I invite you to do some further reading on this matter and then re-look at your question and/or statements about the devil working. Here’s something then to bring everyone’s “research” into a more sobering light. I spoke personally with an award winning American journalist who knows a millionaire who set out to, in his words, deliberately ‘destroy Medjugorje.’ It had to do with a personal issue against his wife, who was a “devotee” to Medjugorje. And so the millionaire did; he hired film crews, documentary crews, and “writers” to concoct some pretty negative tales about Medjugorje. This was all conveyed to the journalist who was an acquaintance of the millionaire. The journalist said to me, “I’d venture that perhaps 90% of the negative propaganda against Medjugorje out there is a fruit of this millionaire’s campaign to destroy the apparition….” If I have seen anything it’s that Medjugorje supporters are to quick to admit anything negative about the apparitions, and detractors too quick to accept as fact sometimes dubious “sources”, especially when they haven’t even been there. If Mr. Belanger feels compelled to expose Medjugorje, then that’s his perrogative. However, if I am compelled to simply wait for the Vatican to clear the air, then that is mine. In the meantime, should we not all, Belanger included, be thankful to God that tremendous good is flowing from there, despite the”definitive” conclusion that is coming? Thanks for your comment, Mark. However, for every “bad fruit”, there are also priests, bishops, cardinals, and yes, a pope, who have given their unqualified support of this place. However, you have chosen to reference the diocese of Mostar which itself has been hostile to the Vatican’s directive to not interfere with the happenings there, including the visitation of pilgrims. If we are going to point out any disobedience, one can start with the diocese there itself. Besides, the dispute between the Franciscans and that diocese long predates the alleged apparitions. What do six children have to do with Church politics? I can no more control my own spiritual director’s behavior than these children can control bickering clergy. If my spiritual director “goes south,” am I too be accountable for him? The Vatican has prevented any possible squashing of what is occurring there, despite the fact that it has every opportunity to end the situation many times. Why? And that is my point: I am not smarter nor more perceptive than the Vatican. If the Church wishes to, in the spirit of St. Paul’s admonition to test all prophecy, continue this process, then let them. From what I’ve seen over 25 years of my travels throughout all of North America and abroad, having ministered in more parishes than most bishops, there is good reason to not interfere too quickly with Medjugorje. The good fruit enormously outweighs the bad. There will always be both, because human nature is involved—including weak and fallible “seers”. Peace be with you! Thank you for your thoughts. I wish to offer some of my own. 4) Concerning the “three more days” point, Donal Anthony Foley provides some food for thought on this aspect of Medjugorje. He demonstrates a consistent quality to the alleged apparitions of that first week or so that questions a supernatural attribution. I invite you to read his work, especially after the [announced] revised edition is published. You only see good fruits in Med. What Kind of Fruits are These? 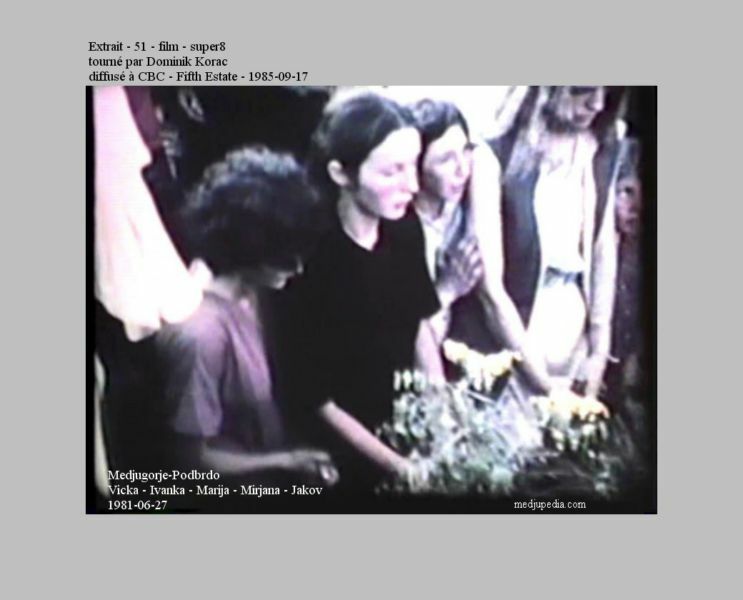 concerning the alleged apparition of the Blessed Virgin Mary in Medjugorje. On May 14th, three Bishops from Uganda came to visit Medjugorje and from there went to visit Bishop Ratko Peric of Mostar (their former classmate in Rome) in order to inquire on the local Church’s position on the so-called events of Medjugorje. The undersigned was also present. 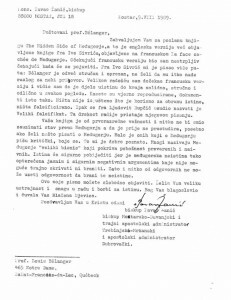 The Administration of the Franciscan Province of Herzegovina, which was punished in 1976, has, from 1982, been given the further penalty of being “ad instar,” due to its unwillingness to implement the decisions of the Holy See regarding pastoral services in some of the parishes of the Diocese of Mostar-Duvno. Many churches have been built by the Franciscans through the help of the faithful and benefactors, which they blessed themselves, without even informing the local Bishop, which goes against Canon Law and the charisma of St. Francis. A church in the parish, Ljuti Dolac, was blessed in this way on April 23rd of this year. In Medjugorje itself, many ecclesiastical buildings have been erected without any permission from the proper Church authorities. More than ten Franciscan priests do not have canonical faculties to hear confessions in the Diocese of Herzegovina. Some due to their own fault, while others, due to the fault of their Religious communities, which are not fulfilling the Papal Decree. More than forty Franciscans have not received the necessary faculties to work pastorally in Herzegovina, yet they don’t even bother with the decisions of the legal Church authorities. Some of them are currently in Medjugorje. Many Religious communities are living and working in the parish of Medjugorje without the permission of Church authorities, such as: “Beatitudes,” “Kraljice mira, potpuno tvoji,” “Cenacolo,” “Oasi di pace,” and “Franjevke pomocnice svecnika.” Hence, Medjugorje has become a place of religious disorder, disobedience and anti-ecclesiastical activity. Last year, some “Catholic faithful,” with the knowledge of the Franciscans, built a brick wall over the entrance doors of the church in Capljina and the Cathedral’s affiliated church in Miljkovici. Two Franciscans who are without canonical faculties for the parish of Capljina, are currently working in the enclosed church. Everything they are doing there is unlawful and the marriages performed are invalid! Some of the Franciscans in Mostar are ignoring the legally-established Cathedral church and the four diocesan parishes in Mostar dedicated to the four evangelists, while they continuue to organize religious services with the people on their own, against the specific decisions of the Hole See and the Head of the Franciscan Order. The Provincial “ad instar” has, on many occasions, warned his brothers in writing, that serious measures of the Franciscan General Administration are being considered for the entire province due to their disobedience. The counter-Church organization “Mir j dobro” (Pax et Bonum) was allowed to borrow the shield and motto of the Franciscans, who have not distanced themselves fron their group’s illegal activities, even when this was asked of them. Hence, these are some of the “fruits” of those who are using Medjugorje to “sell shady peace” to the world, and who have hardened themselves in their disobedience towards the Holy See and the Franciscan charisma. On may 15, there appeared a dispatch from Medjugorje in Slobodna Dalmacija regarding the Ugandan Bishops, whereby the “seer&,#34; Ivan Dragicevic, transmitted the Madonna’s message, who on that occasion, said that she is “very pleased that the Bishops are in Medjugorje.” Ivan had been in the seminary in Visoko during 1981-82. The Commission investigating the “apparitions” questioned him once in Visoko. On May 9, 1982, he wrote: “A sign shall occur in June.” Nothing happened in June! Later on, he was expelled from Visoko due to poor grades. He continued on in Dubrovnik from 1982-83. During his two-year stay in the seminary, he said that he was seeing the Madonna and that she told him that he would be a priest. Yet, he was expelled from Dubrovnik, once again for poor grades. In 1994, he found the former Miss Massachusetts, Loreen Murphy, whom he married in Boston (Slobodna Dalmacija 9/11/94). On the day of the wedding, the groom “had an apparition” in Massachusetts. The Madonna seems to be following him around the world as with some of the other “seers” of Medjugorje. Now he presents the Blessed Virgin Mary as being “very pleased that the Bishops are in Medjugorje.” This type of “message” is not only a clear advertisement for Medjugorje, but a simple invention aimed at making the naive “avert their ears from the truth and turn to extravagant tales” (2 Tim 4:4). 1. If Medjugorje were of God, then we can be assured that Satan will do his best to discredit the apparition. Is it possible that Satan appeared as “Our Lady” at this new and vulnerable time for the visionaries, and that the idea of “three more times” came from the adversary? Satan has appeared to many mystics, saints, and seers over the centuries… I am not disputing Monsieur Bélanger’s evidence, but asking if there are other factors involved, including a deception. 2. Regardless, even if this entire apparition were false, I would not want to interfere with the indisputable evidence we call “fruit.” I think it would shock Louis as well as many who wish to “solve” Medjugorje how many priests throughout the world have been secretly (or not so secretly) converted through Medjugorje. Some of the most faithful priests I know, some known by millions of people for the incredible work they are doing for the kingdom of God, were converted there. By whom? The Devil? “A kingdom divided against itself will fall.” Add to that the millions who, prior to their experience at Medjugorje, were nominal Catholics. I know many now who have powerful apostolates in the Church. What do we make of this fruit? A work of Satan? We can’t say the fruit is good and the tree bad. That’s contradictory, no? Why is Louis fighting this? I don’t know. I assume it is because Louis wishes to “save” souls from being deceived. But the truth is, I have met countless people who have returned absolutely changed (and others, who simply felt peace). My father’s aunt was physically healed on the mountain (she could barely walk); passed out at the foot of the mountain, and mysteriously came to at the top in perfect health. Her and her husband became devoted and strong Catholics until their death. Is Satan doing this? Would God bless Satan’s efforts so universally for pilgrims from around the world? Are my Great Aunt and Uncle now in hell, for surely, that would be Satan’s goal? In fact, if this is from the devil, I pray God lets him do this in every parish! I am not disputing Monsieur Bélanger’s evidence; I am simply saying, why interfere with what is happening there, most especially—and let me stress this—most especially if the Vatican has interfered several times to prevent the phenomenon from being quenched? If God wants to use something evil to such a great degree, then who am I to try to bring it all down? And here I ask, what is the bad fruit of Medjugorje? I personally have not seen it, though some have not had good experiences. But let us be honest; is that due to weak and fallible human beings at the apparition site (grumpy priests, fanatical pilgrims etc.? ), or due to some demonic experience? What is the bad fruit of Medjugorje that is spreading throughout the world? Some have suggested that the apparition will cause a schism in the Church. But this is illogical. Pilgrims who have been transformed through Medjugorje have often become more faithful to the Magisterium; many I’ve spoken to have said that they will obey whatever the Church eventually decides. They will be faithful. So what is the bad fruit spreading throughout the Church, I ask? What terrible cancer is spreading throughout our parishes? So far, from what I’ve seen, it’s stronger devotion to Mary, more involvement in parish life, and spiritual and physical healings. The devil is doing a good job. I would not want to fight against God, or the Vatican. I have seen too much good fruit over 25 years (and yes, there will always be bad experiences by some) for me to go on a crusade against it. I was there once. It was a peaceful experience. I felt the “presence” of the Mother in a profound way. But then, I have felt her presence at other times too. What I did see in Medjugorje were many souls experiencing profound healing. Again, thanks to the devil, souls are drawing closer to Jesus. Yes, if this is of the devil, may the Lord permit Satan to bring his deception to every parish in every diocese. The conversions and resulting faithfulness to the Magisterium, to Our Lady, and above all to Our Lord, would change the world. During the Balkan Wars efforts were made to bomb Medjugorje. Not one bomb went off over Medjugorje. Not one soldier from Medjugorje died in the war. Irish singer David Parkes was cured of Crones disease at Medjugorje:http://johnbarrysblog.blogspot.com/2010/12/medjugorje-miracle-healing-of-irish.html . I could write much much more. You will be proven wrong. I also, and many known to me, have suffered disastrously through my involvement with Medjugorje. I was horrified when it began to dawn on me that it may not be what it claimed, but in the end relieved. My life has blossomed since I became free of this dreadful addiction and my love for God has matured and deepened. I only feel motivated to comment on it now that there is to be an inquiry, it’s time the truth became known. If you base your doubt on that statement you are without help. That is not a firm statement from heaven. Something is not “the Gospa told me.” its the guess of a teenager. 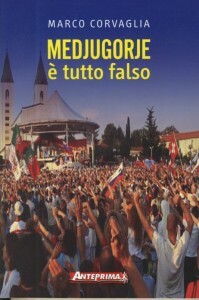 I am bewildered and amazed at the so called proofs that people use to charge that Medjugorje is false. The fruits and the longevity speak for truth and not fraud as Rick Salbato and E Michael Jones charge. The late Bishop Zanic said it was true that they could not be lieing, then he said they are lieing. Sorry his opinion was flawed by his early position being so positive and then changing his mind. . You can’t flip flop. And Ratko Peric doesn’t believe in the apparitions of Fatima and Lourdes so he is out of the running for seeker of truth. Medjugorje is a gift from God. The fruits are overwhelming. I realized that Medjugorje is not for me when I saw my cousin’s life change for the worst after her having visited Medjugorje. I, like others who have posted here, have spent many years trying to present the facts concerning Medjugorje, while praying to Our Lady for help in exposing the hoax. I am so happy to see others take on the battle because to tell you the truth, I am so sick of it and have decided that, with all the information presented on my website and forum, Diane’s blog, Kevin’s blog, Unity Publishing, and Richard Chonak’s blog, Donal’s book etc., if the good people out there still choose to believe that this entity in Medjugorje is OUR MOTHER, then there is nothing to do but pray for them. It doesn’t take a rocket scientist to know that Our Lady is not someone who cannot make up her mind, would change her mind after making a statement, or have to think about appearing in Her Son’s Church instead of some hill. It is just amazing how the enemy can fool so many people. And yes, when the first publications of these so called messages came out and weren’t quite in line with what the church teaches, the books and messages were reprinted and made to be in line with the Church. On the UnityPublishing article is a reference to the book “The Holy Catholic Church and Private Revelation“. You can read it online here. Ok, I found the proper name of the false apparition: It’s Necedah, Wisconsin. NOT Ninvolt. Have you ever heard of the false apparitions of Ninvolt? (Not sure if I spelled that right) They had some similarities (and differences) to Medjugorje. I encourage you to research them, they might help you better understand apparitions in general and Medjugorje in particular. I also encourage you to research the writings of ex-Father Maciel and of Father Gobbi, the latter of whom is said to be a visionary. Maciel called on Catholics, and priests especially, to obey the Church, love the Pope, go to Mass, and serve Jesus Christ to the fullness – yet he lived a hypocritical life. Gobbi is said to have locutions from Mary, but they contain some heresies (such as the belief Jesus would return in the year 2000) and he is purportedly in disobedience to Rome because Rome told him to stop talking about his “locutions” and start calling them “private meditations” yet he has not. 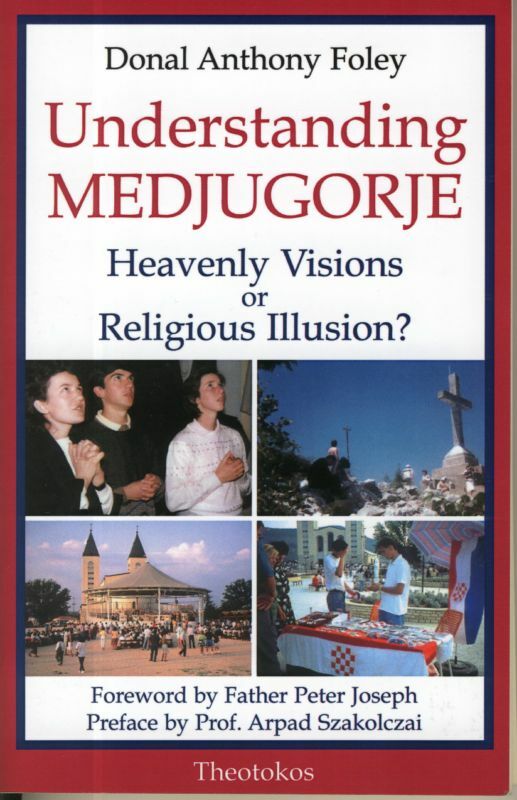 I find these two cases fascinating because they completely destroy the Medjugorje supporters’ arguments, namely, that the messages and fruits are good so Medjugorje must be good (when you compare Medjugorje to Maciel) and that the Bishop had no authority to tell the visionaries to stop publishing the messages (when you compare Medjugorje to Gobbi). There is also the case of the Holy Love Ministries, who’s so-called “private revelations” are still ongoing yet whom the Bishop has condemned as false even before they have stopped. If you read his letter of condemnation, you can see the Holy See promptly and ordered him to make the condemnation – so the Church does seem to teach that a private revelation can be judged by the Church even before it ends, especially it if it bears bad fruit (like that of monetary gain, which the Holy Love Ministries is guilty of). Nick = I just watched the video. Very interesting. Nick = There is other video evidence of Medjugorje, too. One is about the so-called “slipping Jesus” incident in the chapel. The “slipping Jesus” incident appears in French and in English at Marco Corvaglia’s site. Many things have been said about these sequences that I have filmed. I will write a complete article in due time on the whole case, with the physical parameters on Vicka’s reaction examined by a colleague physicist. Nick = Another is about the first few apparitions of the visionaries where their former spiritual director would ask them, “Do you see anything? Do you see Mary?” It is all very interesting. At the beginning of the events in 1981, the visionaries saw different entities. The visionaries seem to have been coached to sort of spiritist seances. Yet Slavko Barbaric knew what was at stake. We had studied psychology at the same university, in Freiburg, Germany, and he had presented himself as psychotherapist to me. He didn’t seem to get it. I guess he and Ivica Vego wanted to please me by showing what looked like «parapsychological field research» for them. I could not hide my anger at him and Vego and I almost lost my temper. At the time of my visit to Medjugorje, I had every reason to believe in the authenticity of these events. But the view of these scenes in that context shocked me. I told him that if outside people would know what I had seen on the tape, there would be a definite risk to undermine their «cause». Then the researcher in me regained his composure and I left the rectory, stunned by having heard and seen so many disturbing things in the same hard day. A day that began with my second visit and long interview with Mgr Pavao Zanic, early at 7:30! I believe the “scientific studies on Medjugorje” referred to in the first link have already been well dissected in the “Science Mortified” posts at Marco Corvaglia’s site. As I recall, they include the video that Louis was involved in when a poke towards an eye resulted in the “Baby Jesus was falling” alibi. As it didn’t seem to be in English, I’m not sure what the video linked to is saying. I would prefer to leave the visionaries’ status to Rome, but I do share your concern. Your website is very interesting. I pray that the Truth comes out soon on the authenticity of Medjugorje because I believe it is harming the unity of the whole Church. Regarding the conjuring of the dead, it seems difficult to match Mary from Fatima with the apparition of Medjugorje because Lucia had written that she missed the two little sheperds, Jacinta and Francisco, who had gone to heaven before her to much and she could not deal with the death of her father either. Why would Mary not reward Lucia with a visit from her cousins, and her father, too? I have not read in any of the approved apparitions that Mary brings a relative back from the dead to reward the seer for something that they did! They are visionaries of the wrong kind that have created confusion among the Catholic community for years. I remember back in ’88 a priest friend and I were up in the choir loft where the seers were allowed to have their “visions”. We were no farther than 10 feet away, when at 6:40 pm they dropped to their knees to experience whatever they were seeing. I have no doubt that they were seeing something. But over the years I feel that they are seeing something that is not the Virgin Mary. When you take in the disobedience, the fame and fortune some of these seers have received just does not seem right. Ivan the seer has reaped in quite a bit of profit with his “travel agency” in promoting pilgrimages to his home. Add what he rakes in with his public appearances the man has become a millionaire. Of course I can’t prove he’s a millionaire but connect the dots, real estate property and he doesn’t travel the world with his performances for free. The sooner the Vatican makes a decision on this Medjugorje phenomena the better. Thanks for your comments and questions. I will answer them during the weekend. Let us pray for the visionaries of Medjugorje that God may give them the graces of holiness and salvation. Whether visionaries or not, they are poor sinners and Jesus came not to save the righteous but the sinners. Alas, even in the religious goods stores located next to the Vatican, shelves are full of Medjugorje material. Whatever sells, I guess. I would hope that Marco Corvaglia’s new book finds a home in those same stores soon. I meant to acknowledge here, Louis, what you wrote on June 22nd, 2010 at 12:13 with regards to my post…. I could not translate any large pieces, but I do understand some here and there. I can hear a distinct, “…još tri puta” (yohsh tree pootah), which means, three more times. I also hear them saying “Friday”. Thank you for your followup here in the combox on my post at Te Deum. The video that you saw about the “infant Jesus slipping” was at the blog of Marco Corvaglia (I think others picked it up, but you want to go to the original where there is indepth explanation). Marco is in Italy, but he has translated much into English in an entire section. This is what you will want to see. Note that Louis was the one filming, and is also explaining what happened back then. Would you consider the following quotes by Ivanka the seer as bordering on Necromancy the conjuring up of spirits? This is a practice contrary to the Catholic teachings isn’t it? It really is very hard to believe that her dead mother would come back from the spirit world and actually physically hug her. Smells of something very demonic to me. Our Lady asked Ivanka if she had a wish. Ivanka replied she would like to see her mother. This has been a request Our Lady has fulfilled for Ivanka on four separate occasions over the years. When Ivanka describes her favorite of these special visits, tears spring to her eyes as she remembers the joy of that moment. Marco Corvaglia has translated some parts of my first and second posts into Italian. Since February, Marco has helped me to exchange with some of his interesting readers. 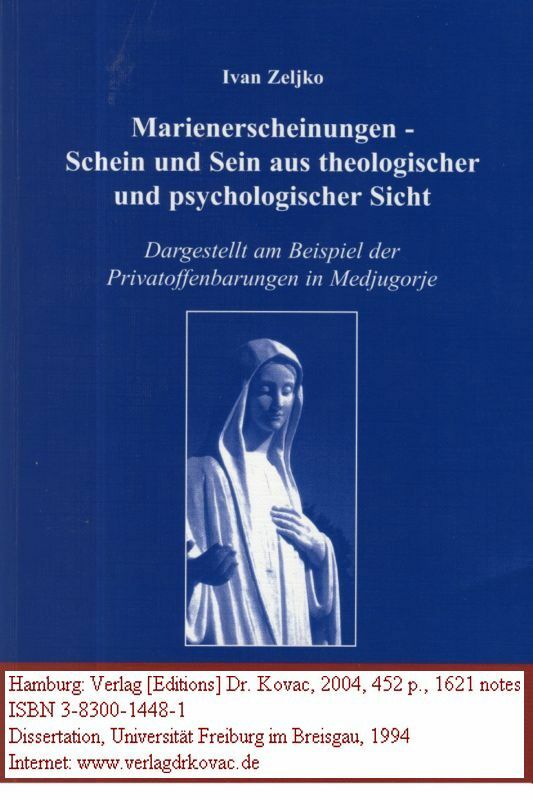 He has written a critical book on Medjugorje: Medjugorje è tutto falso and we share our mutual interests for the critical study of parapsychological phenomena and of Medjugorje. You will find, in the English section of his site, an appreciation of his book by Dr. Giorgio Gagliardi who has conducted scientific investigations on the Medjugorje visionaries. As you visit the English section, please take the time to read the 28 translated articles that are well documented and that you won’t find anywhere on the Internet. Caro Marco, I wish you courage and tenacity! I just watched the video. Very interesting. There is other video evidence of Medjugorje, too. One is about the so-called “slipping Jesus” incident in the chapel. Another is about the first few apparitions of the visionaries where their former spiritual director would ask them, “Do you see anything? Do you see Mary?” It is all very interesting. You are expressing a suggestion according to which I should ask directly CBC and not Dominik Korac for the permission to broadcast his film. And you ask if you are right? No, Giuseppe, I would not do it. I have not seen the contractual agreement between the parties but I suspect that Dominik Korac has not yielded his rights for an indefinite time. He is still the owner of his film and has still the full copyright on it. Even if CBC would give me the permission, I would still wait for Mr. Korac’s permission: it is an ethical decision. Particularly if you confide the document to YouTube — it is the best and simplest way to have the video clip administered — do not count on any possibility to recuperate your rights! I regret to conclude that for me, the case is closed unless Dominik Korac gives his personal agreement. You may call me Kevin and I shall call you Louis. I do not know how much help I will be with the translation as it has been 11 years since I studied French in a classroom but if there is a need, I will do what I can. E-mail me privately to discuss the matter further: StMi49531@aol.com. I am also available on Skype and will communicate that information to you on E-mail. I can say that I have spoken with a canon lawyer about the “non constat” question and have received some clarification. That clarification is reflected in my response to your comment. Hope all is well and I look forward to speaking with you further. Grazie per la risposta. Un suggerimento. Secondo me, occorre chiedere il permesso per la riproduzione del video non a Dominik Korac, ma direttamente alla CBC. Giusto? I thank you very much for your message of encouragement and support. I must say that I have specially appreciated your post on the discernment of apparitions and your comments on the subject that is still open to discussion and thorough examination. Your generous offer to translate from French into English is surely appreciated. I guess it concerns the documents published by Daria Klanac. Your help will be precious when I will discuss precisely the reasons of some discrepancies between both publications of the transcripts and the nature and importance of the divergences. We could offer our teamwork to our respective readers as a kind of follow-up to the evaluation of Donal Foley (p. 38-43). What is your sense of it? 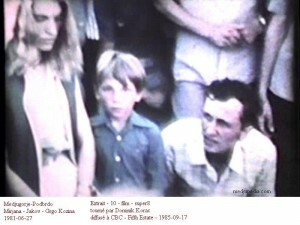 You ask me if it is possible to see the complete super8 document filmed by Dominik Korac on 1981-06-27. I would rather say, for the moment, that it is not possible. I have obtained a copy of the film through Walter Fürhoff, a German photograph whom I have known in Medjugorje, in January 1985. When the CBC (Radio-Canada – English) asked me to broadcast it in September 1985, I referred to the owner, Dominik Korac who was living in Hamzici. They reached him and had a contractual agreement with him. As you have seen in The Grand Concealment, I have posted a few frames of his film that has been broadcasted by the CBC, 25 years ago, which is in agreement with the rule of fair use in the context of the international copyright laws. Indeed, the reproduction of a few frames, parts of a complete film, is permitted when used for educational purposes — critique of a work, for instance — provided that you give the source and do not make commercial use out of it. This is, at least, how I understand the ethical dimension of the question. Unfortunately, the technical quality of the document is rather poor, at least of the copy I have obtained. There is not one long fixed sequence. The camera is moving rapidly, sometimes out of focus, and à contre-jour [against the light]. The frames that I have chosen are the best and most significant ones that I could find. Nevertheless, if one reader from Bosnia i Herzegovina succeeds in getting in touch with Dominik Korac [or anyone who has filmed or taken pictures between the 24th of June and the 3rd of July, on the Podbrdo or in the church], I would be very happy to ask him for the said permission to publish it on YouTube and more importantly, to have a long conversation with him — maybe on Skype? The same applies to Walter Fürhoff! I hope that my answer satisfies you. However, I left the one that concerns the present post, with Fr. Laurentin’s interpretation of messages that he did not reproduce! As one sees, it is rather “short” for a prolific chronicler! I might be able to help with the French-English translation, though I am sure you would be able to do a much better job, Monsieur Belanger. Thank you for your echo to The Grand Concealment. Since I do understand some Croatian I was able to follow along. It is clear that the visionaries said on that day, that the “gospa” would appear “three more times”. That is exactly the point I wanted to make. If bona fide Medjugorje devotees insist on putting the Three more days into question, they must first examine the authenticity of the tape and of the content, including the identification of the voices. 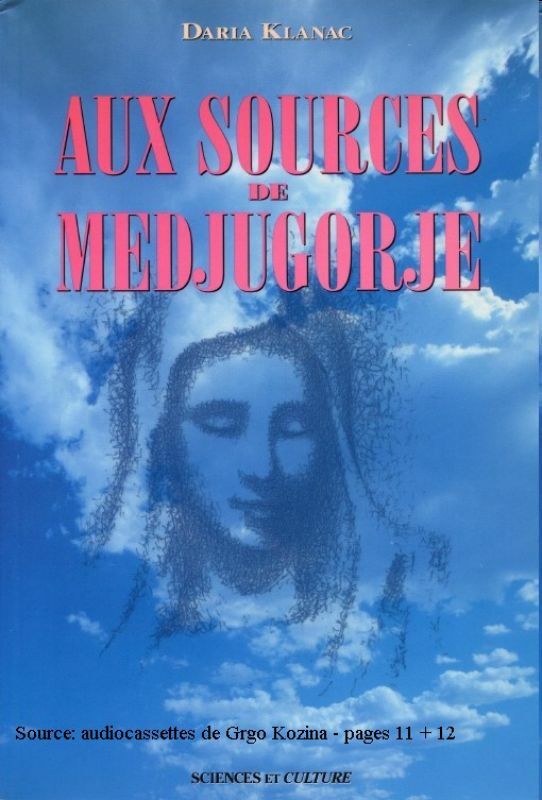 Since Daria Klanac, a Medjugorje devotee, has published her own transcriptions of some tapes, they should be considered by the proponents as a reliable reference . Unfortunately, those transcriptions have not been published in English. But a devotee who is a diligent searcher of truth will easily find the means – like a friend who knows French or, at least, an automatic translator – to compare Fr. Sivric’s transcriptions with Mrs. Klanac’s. There are even some of them on the Internet. In that last reference, Mrs Klanac mentions only one instance confirming three more days in the evening of June 30. In fact, there are seven of them as you have seen in my post. Moreover, Mrs Klanac submits a “symbolic” interpretation to the number “three” which Fr. Zovko, the visionaries, Donal Foley (p. 74) and myself do not share. As I indicated in the post, Donal Foley has made the exercise with positive results. The ball is in the proponents’ camp who are invited to participate to the discussion on this blog. The interesting thing to note is that the entity of Medjugorje has appeared more than 40,000 more times over the past 28 years, and within days to be 29. Is it possible that, if this were the Blessed Virgin Mary appearing to them, that she would not know then, that she would appear over 40,000 times and counting for the next 29+ years? That is one of the pertinent questions that I will address, once I am finished with the unveiling of the key proponents’ duplicity who manipulated the messages in such a way that we get the impression that they come from the Virgin Mary. è possibile vedere il filmato completo dell’apparizione del 27/6/1981? Go in the peace of God. (L.2,50). On that day, Mirjana thought that she understood that the Gospa would return for three more days, until Friday. But it was only her interpretation. How strange. It seems the apparition is a projection of the visionaries’ thoughts – or at least conforms to their thoughts. That’s the impression I get, at least. Also, I am sure some supporters will be unhappy with your sources and call them false, yourself a liar, and this site anti-Medjugorje or something to the like. But I pray that the grace of the Holy Spirit will open all minds to the truth. Monsieur Belanger, this is a great article. Very slow and methodical in its approach. I am looking forward to the next installment.